1. Place the flat tire face down in the spare tire well. 2. 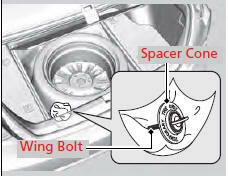 Wrap the spacer cone and spare tire wing bolt with cloth or paper, and store them in the spare tire well. 3. Store the jack and tools in the tool case. Place the tool case on the flat tire. 4. Lower the trunk floor lid, then close the trunk. Loose items can fly around the interior in a crash and can seriously injure the occupants.